After a bit of disappointment last year, I was very late to the game this year. Due to things out of my control that went wrong, I held onto some frustration far too long. It wasn’t until the end of August I started to doodle and formulated an idea for my final haunt. It’s just too bad the theme didn’t come together until last year. Coulrophobia, the fear of clowns. It may be irresponsible, given social media and the effect it’s had on clown making appearances throughout the country. Nevertheless, I am back with what I hope to be the biggest and best haunt Vintage Parkway has seen. With clowns on my mind, I am continually referring to Dm Pranks Productions, their clown pranks are nothing short of awesome! While that fulfills a small portion of the haunt, the rest I had designed based on what I’ve built and bought the last 4 years. Truely, it’s been a passion putting together a haunt and hearing about children exiting, in tears. That alone brings a smile to my face in the sense of a job well done. This year’s plan centers around simplicity. In the past I have designed layouts that were far too complex. 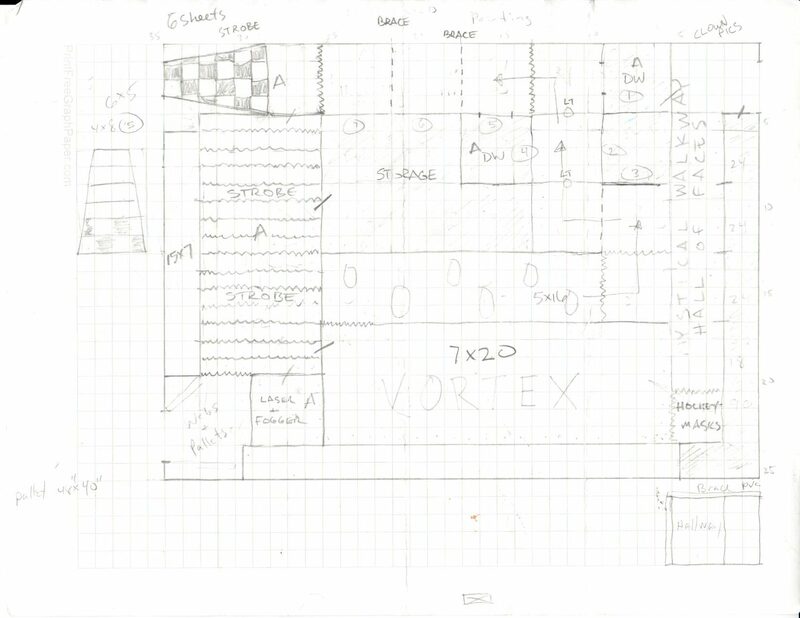 With a floor plan of 24’x34′ I wanted to create something with that “wow factor” while keeping the layout simple. In past years, what works good on papers doesn’t necessarily work well once you are building. This year everything was measured down to the exact foot. Surprisingly enough when I walked the stage I was amazed that my layout actually fit with very little revision required. Minus the entrance and exit, there are seven areas of varying size and complexity. Two years ago Mark G. and I built drop panels, which are going into their third year. Each year I have added more 4’x8′ walls, which now total 44 feet (11 panels). These wall panels are quick and easy and honestly, beat hanging plastic on a PVC frame. I took to Pinterest, which was a mistake, as new and ingenious ideas crept into my head. I used four Pinterest links and turned them into a reality for the 6th Fright. The past 3 years years the focal point of the haunt has been the Dot Room, an 8-10 foot, round room with fluorescent dots on the walls. Yet all is not what it seems, as there is an actor in a dot suit who stealthily moves around the room. It was a great addition, but the kids expect it now and the “wow factor” is gone. The same is true for the drop panel, which I still haven’t perfected (See Halloween Hellmouth! ), but will give them one last chance. Last year I happened upon a post at HalloweenForum.com discussing the implementation of a laser vortex. After finding instructions, Tom V. and I made this happen last year and the result was better than expected! Based on the plans I had seen, our hallway was too short at 20 feet and just 8 feet wide, but we made it work after trial and error. It wasn’t without problems, as the fog machine got stuck on at some point and made too much fog, ruining the vortex effect. An original score by Mark Klem turned this into a favorite! 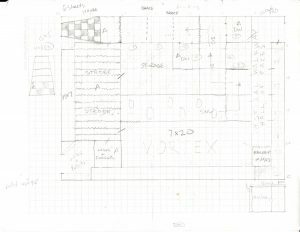 I also had to build in storage space, as all the classrooms are full and with 4 sets of risers, chairs and tables, it only made the design more challenging to fit all the rooms without compromising the overall haunt. This was accomplished in part to the 4’x8′ wood walls and the drop panels. With 3′ support structures, I was able to build a 15’x7′ area to store stuff not used in the haunt. The same goes for building 2 feet off the wall down our first hallway, as there is a piano I was not about to move. New to the start of the haunt this year is a mystical walkway, which I pulled off Pinterest. I will hopefully (if the PTA moms come through) have a 16′ long hanging body bag corridor, which was another find. Finally a room I call ‘coulrophobia or claustrophobia (COC).’ Dimensions of the room at 15’x7′ and every one foot increment is hanging plastic. In the dark, with strobes going, will make finding your way difficult. Oh did I mention the clown (me, aka Jerkface, my clown name) who will be hiding in this week with bright lights and loud noises to scare the piss out of every guest. Overall I am pleased with the design and how the haunt is laid out. There is just one area of concern in the COC room, as the room decreases in size in two areas as you get closer to the exit. I can see many guests crashing into those walls, which might reveal a design flaw in that corner. This could have repercussions as it shares a common wall with the exit of the vortex and the body bag hallway. Safety is my main concern and I don’t want any crashing into a wall they don’t see.